I happened to have five bunches of kale in the fridge that I stripped and began cooking last Friday evening for no reason other than the obvious one that it needed to be cooked. Then our son Oliver and four friends rolled through the door from New York. Hi hi hug hug. Got anything to eat? We’re starving! Ah-ha, that’s why I was cooking the kale. In ten minutes five bunches of cooked kale seasoned with a little garlic and some hot red pepper flakes disappeared. Don’t they feed you at that school? I wanted to ask as they headed out the door. Two of the kale-eaters were headed to New Hampshire and needed to be dropped off somewhere for the next stage of their trip. If they’d had ten more minutes they could have had Spaghetti with kale, salami and toasted garlic. Kale is fast, easy, delicious, healthy as God, and this dish meets my standard for a last-minute pasta recipe – prep done by the time water boils; sauce finished before the pasta is al dente. With Jody opening TRADE I’m anticipating a string of long days and nights ahead. Work will take a bigger bite out of her waking hours, we’ll have less time for kitchen prep, with more meals squeezed into the dark end of the day. That’s the way it goes until a new restaurant finds its feet. We started this blog five months ago talking about just that kind of meal. As fall unfolds we’ll be eating – and writing about – a lot more of them. I’ll be cooking more often (buckle up), and the blog may become a little more ad hoc. Like life. Strip the leaves off the stems of the kale. Discard the stems. Wash and drain the leaves. If you’ve never prepped kale check out Jody’s notes before you begin. When the water is boiling add the kale. Stir until the water returns to a boil. Cook 5 minutes. Scoop the kale out of the water and drain in a colander. Do not discard the kale water. Allow the kale to to cool briefly and then chop fine. 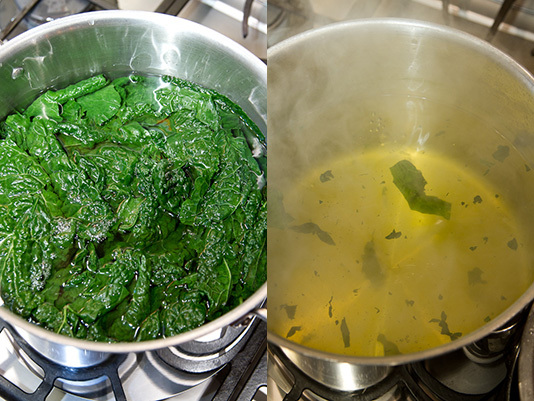 Add the pasta to the kale water, cover briefly until the water returns to a boil, then remove the cover, stir and cook 7 minutes or until al dente. 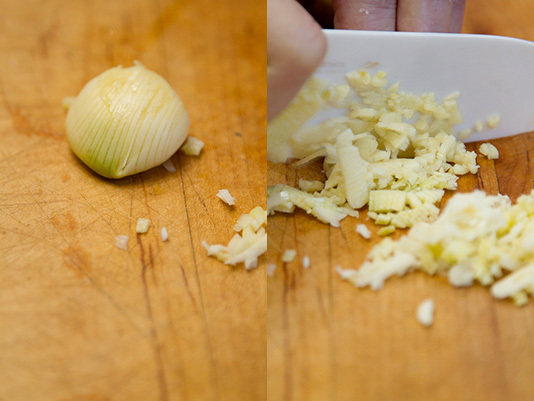 While the pasta is cooking, heat the oil with the garlic over medium heat and cook 5 minutes or until the garlic is toasty. Don’t let it get too dark or it will taste bitter. 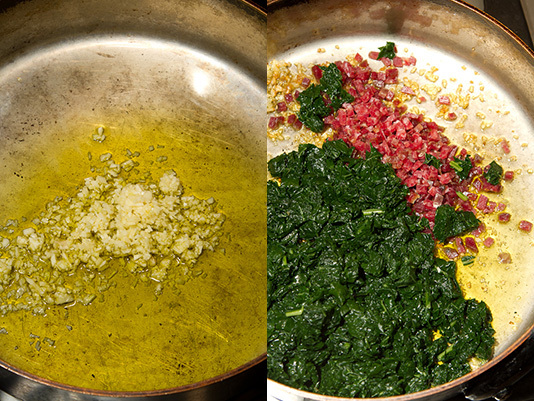 Add the salami and chopped kale and cook 2 minutes to meld the flavors. Taste and adjust seasonings. 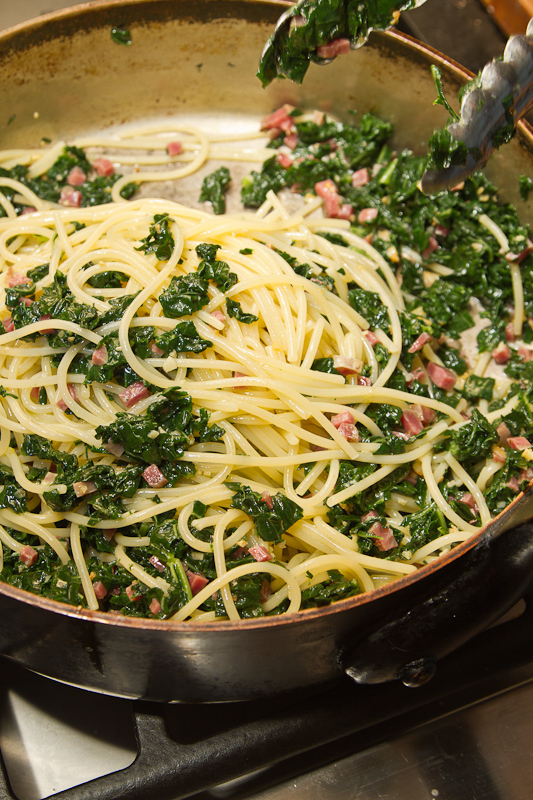 Scoop the pasta out of the water directly into the pan with the kale. 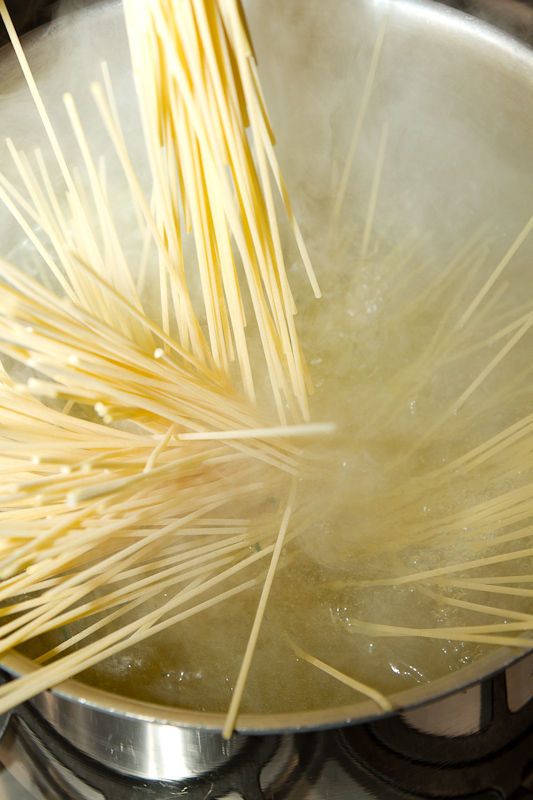 Add ½ cup pasta cooking water, and cook, stirring, for 2 minutes. Season with lots of freshly ground black pepper. Serve in warm bowls with freshly grated Pecorino Romano. No matter how much kale you buy it cooks down to an amount smaller than you need (okay, want). If you enjoy kale as much as I do there are only a couple of solutions– buy armfuls of the stuff and become practiced at removing the leaves from the stalks, or use it in a recipe where you can stretch it, instead of just sucking it down unadulterated. Unlike broccoli rabe, which Roxanne will eat but not actively seek out, kale is one of her favorites. I’ve learned to store cooked kale in a quart container that I can shove toward the back of the refrigerator where impatient teenagers won’t see it. People in my classes often claim to eat kale regularly, but I wonder how they manage when I see them separating each half leaf from the stalk in meticulous little pinches, like someone opening a W-2 statement. Others slice the leaves off, which is a little more efficient, but still too slow for me. 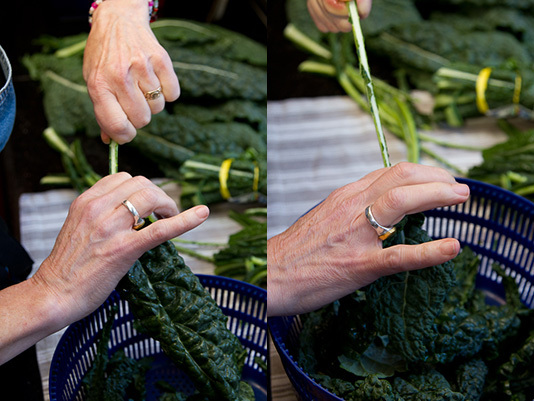 The fastest way of getting the kale show on the road is to grab the stalk at the thick end and then use the forefinger and thumb of the opposite hand to encircle the stalk like a napkin ring. Then, in a single swift show of who’s boss, shoot the ring down the stalk. The leaves tear right off. The fresher the kale, the more efficient this is. Ken prepped five bunches and drank half a beer in about ten minutes the other night. Bouncy music helps. Try to use kale within a day or two of purchase. If your kale is older, slice off the ends of the stalks and soak the entire bunch in ice water for fifteen minutes to refresh it. 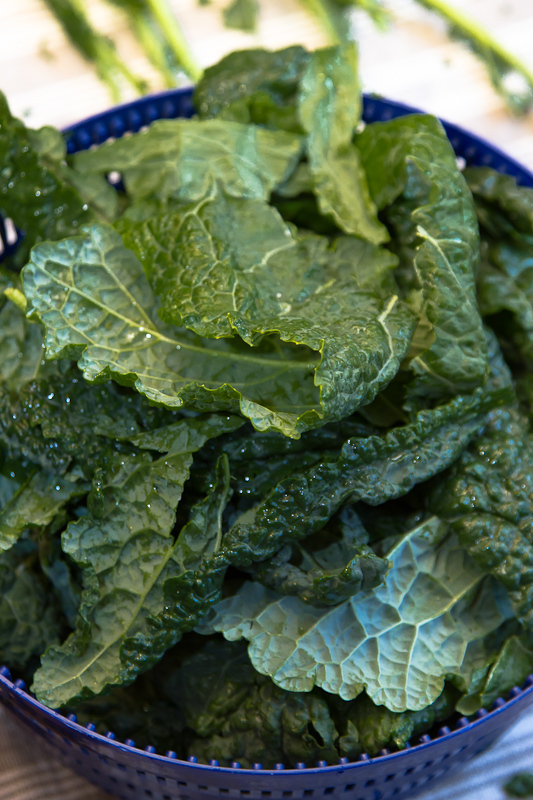 I tend to blanch smooth-skinned kale, and but don’t bother with bumpy-skinned varieties. I blanched the lacinato in this week’s recipe because I wanted the blanching water to flavor the pasta. Also, by blanching the kale before adding it to the pan with the olive oil and toasted garlic I avoided the risk of burning the garlic while waiting for the raw kale to wilt. Kale’s a versatile impromptu ingredient. We had a chunk of salami that was begging for company in a pasta sauce, but the kale would have gone equally well with other items in our larder last Friday – shiitake mushrooms or bacon or hot red pepper flakes. 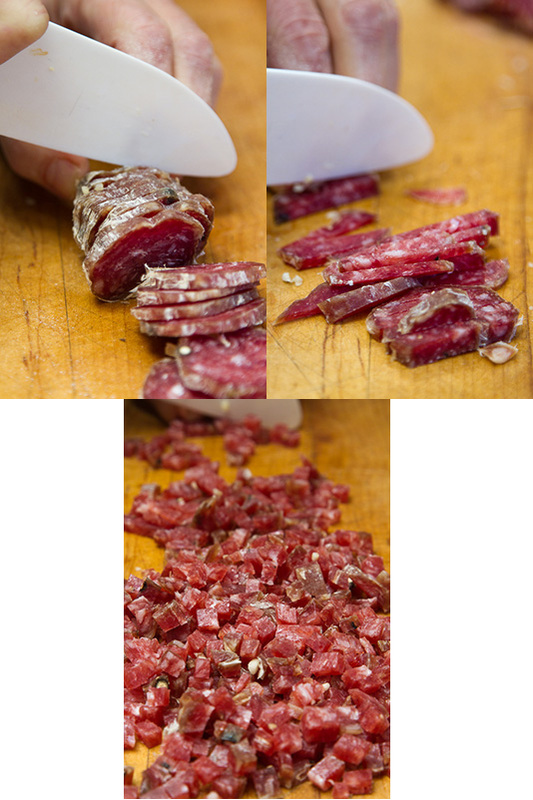 I generally pick only one or two other ingredients to go with kale (garlic doesn’t count) – salami or bacon, or hrpf, not salami AND hrpf – or the flavor of the kale gets lost. 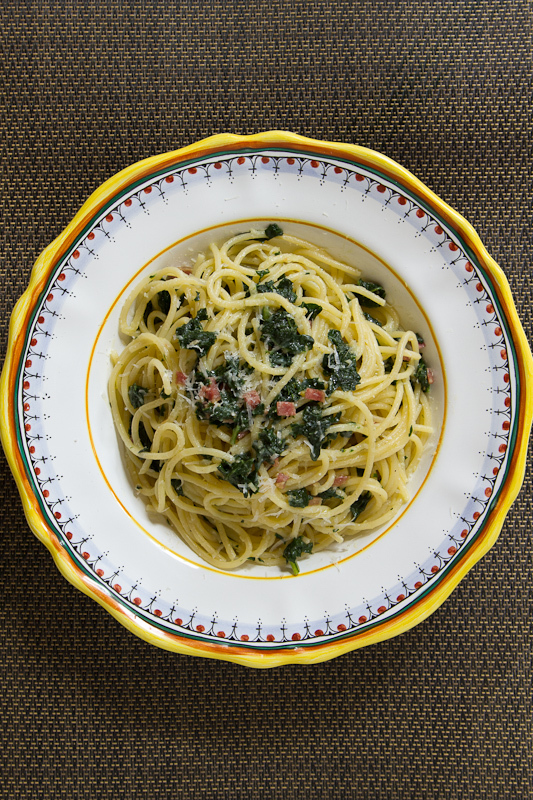 This entry was posted in Easy, Entree and tagged kale, pasta, pine nuts, salami, spaghetti. Bookmark the permalink. Looks like a new staple to my recipe repertoire. Thanks for the tips on cooking kale! I love the simplicity of this dish. Stunning photos as always. 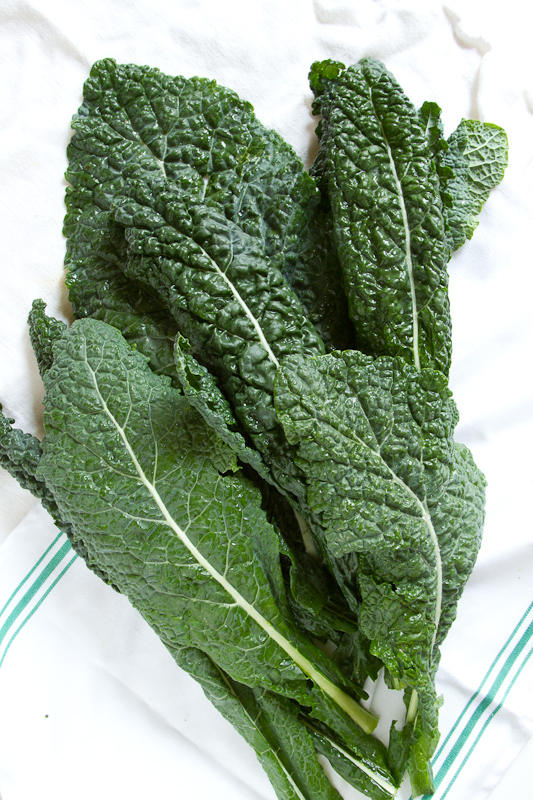 I have cavolo nero in my fridge ready for a recipe I intend to share next week. I’ll definitely be cooking yours though over the winter months. 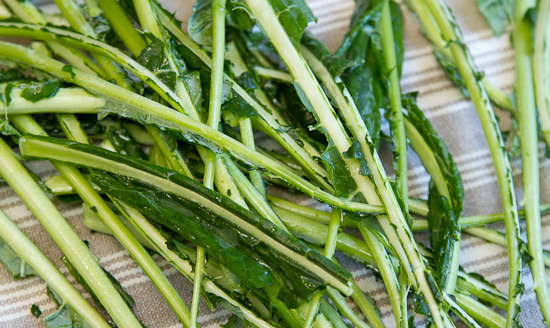 Interesting tip on cooking kale; I have always eaten the whole thing in the past – for this dish though it definitely make sense to discard the stalks. eating one vegetarian dish a week. Thanks, I will leave out the salami and add chopped up Portobello’s. Awesome dish, you two. Love the idea of flavoring the pasta with the kale blanching water, and your de-stalking short cut (I’ve always been a fold the leaves in half and knife’em guy) makes a lot of sense. I’m also excited to hear that beer drinking is an integral part of that technique….nice.
. . . like someone opening a W-2 statement . . .!!! Ken, I’m really enjoying this blog. Can’t wait for the next installment. I’ve never stripped kale leaves from stalks; never noticed a reason to do so. I guess I’ve always sauteed it long enuf to cook stalks thru. I’ve been looking thru local food blogs in an effort to select one to follow and yours is the winner hands down. And the photos are the best too! Keep ’em coming. if your kale is tender enough and you are going to cook it for a bit, stripping is NOT (sorry folks, i wrote the opposite of what i meant.) critical. the stems will also give your greens some nice texture. as for the frost question, i am not a gardener so i have no first hand experience, but i have heard that as well about a variety of vegetables. if you find out more we’d love to know. thanks for the vote of confidence. I made this dish last night, it was excellent! I added some toasted pine nuts for a bit of crunch. I’m also glad to see that the way I’ve always stemmed kale is the same technique that Jody recommends, I can’t imagine any faster way to do it! pine nuts are a great idea! yum. Delicious, and thanks for the reminder that I have baby bellas in the fridge I need to use. Love the idea of how to stem the kale! We just got some curly kale at our local farm shop this weekend but don’t know if the method will work with all the curls! Will give it a try. Thanks for the tip! Lacinato kale is my favorite variety, and I’d love to try this recipe. The only catch: I’m not much of a meat eater. Do you have advice on a non-meat alternative that would still work well with this recipe? (I want the protein to balance the carbs.) Thanks! Thanks so much for your thoughtful reply. I’m new to the world of food blogging; I’ve been so impressed not only with all the great food I’ve been reading about but all the friendly folks in the online cooking community. Have a great night! Cooking update: I fiddled with the recipe to include wild caught shrimp (since we don’t eat salami). DIVINE. Definitely recommend. Next up: Jam thumbprint cookies are begging to be baked in my kitchen. I’m just getting around to cooking this now and I have to say that Jody’s method for de-stemming kale was efficient and fun, more fun than I’ve had in a while (sad, but true). I dealt with the kale in secret, away from certain members of my household who are suspicious of cruciferous veggies. The secrecy made the process even more thrilling! Looking forward to eating this tonight. I am here to confess that I cheapened your recipe by using (God help me) grocery store spicy smoked sausage. It was there, it was cheaper. It was low class, but delicious. Anyway, you got me to cook kale for the first time, and I love it! My 23-month-old ate some when I loaded it on a fork with other things, but he’s not convinced yet. All in good time. FYI, I know you’ve dropped by my blog, but as cooks you might be interested in a tour of the human ego I did involving food photos. He’s getting more picky by the minute, but he’s so darn cute. It is a survival trait at its best. Hi Jody and Ken. I love everything to do with Kale and your recipe above looks delicious. I especially like the photos of the preparation you have done, you clearly took some time in creating this post. Kale is a wonderful vedgtable and is so versitile. That said, not many people really know how to handle it and tend to think of it as rabbit food! Truth of the matter is of course that it is high in nutrients and god giving health so lets hear it for the Kale revolution! I googled “kale and salami” trying to find something to use up the ingredients in my fridge. Glad I did! This was delicious, thanks for posting. Kale is seriously the best.